Alexander Turnbull Library, Wellington, N.Z. Sydney Wright left London on the `Blenheim' on 16 June 1842 and arrived in Wellington on 5 Nov. Later that month he sailed for New Plymouth where he resided until returning to Wellington on 5 Sep 1843. The journal extract covers the period 15 June 1842-26 Feb 1844 and describes the Wrights' voyage to New Zealand and his experiences in New Plymouth and Wellington. John Steel, a 3rd cabin passenger, sailed from London aboard the `Catalonia' on 1 June 1883 bound for Lyttelton. Mary Alice Bailey sailed from London aboard the `Rimutaka' on 29 November 1906. She arrived in Lyttelton on 15 Jan 1907 and then transshipped to the `Tarawera', arriving in Auckland on 20 Jan. John Steel's diary covers the period 29 May-23 June 1883 and ends when the `Catalonia' was 4 days south of the equator. Mary Alice Bailey's diary covers the period 29 Nov 1906 - 23 Jan 1907. Included are biographical notes made by transcriber. Rands' collection of material relates to the immigrant ship `Cartvale', which departed London 24 Jun 1874 and arrived Wellington 15 Oct 1874. Rands' ancestors were on this voyage. The collection comprises transcriptions of original diaries held by the Library, George Smith - Diary of a voyage to New Zealand (MS-Papers-0309); and Edwin Selby - Shipboard diary (MS-1867) The diaries describe the journey from the emigrants' homes to the ship, the passage to New Zealand, including details of weather, shipboard conditions, entertainments and fauna. The diary transcripts are accompanied by transcripts of clippings about the `Cartvale', published in the `Evening Post'. The first entry dated 20 June 1874 relates to the immigrant ship `Cartvale', which departed London 24 Jun 1874 and arrived Wellington 15 Oct 1874. Rands' ancestors were on this voyage. William Godfrey Roberts travelled from London to Dunedin in 1863. He later settled in South Australia. 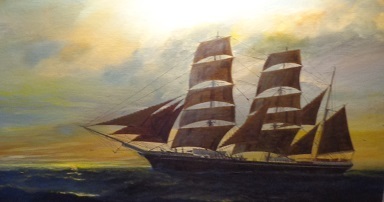 The diary describes the voyage from London to Dunedin on the barque `Cecilia'. It discusses shipboard activities, the personalities of fellow passengers and weather conditions. James McKee was a 26-year-old steerage passenger on board the `Dunloe' which departed London on 29 Aug 1880 and arrived Auckland 9 Dec 1880. The diary describes voyage to New Zealand in 1880. The entries note weather conditions, fauna and shipboard entertainments and also gives McKee's initial impressions of Auckland. The final entry is dated March 1881. Also included is a typed transcript of the diary compiled by the donor which includes details about the ship and its passengers. MacGregor was born in Scotland in 1866. In 1881 her father, the Rev Dr James MacGregor, left his teaching post at the New Free College at Edinburgh and emigrated with his wife and nine children to New Zealand. One child died during the voyage. The family settled in Dunedin for five months and then Rev McGregor answered a call to St Columba's Church in Oamaru. The diary was written by Agnes as a young woman of 14 on board the `Jessie Redman' which departed Greenock on 15 July 1881 and arrived at Port Chalmers on 24 October 1881. Samuel Macauley was born in 1861 in Belfast, Northern Ireland. He travelled to New Zealand with his parents and sisters in 1879. The diary was written on board the Lady Jocelyn which departed from Belfast in May 1878 and arrived at Auckland in Aug 1878. Eleven leaves of the diary concern the voyage, the remaining entries are a `brief retrospective of his life'. Also includes a partial record of temperatures, 16 May-19 Jun 1878, recorded by the surgeon superintendent; abstract of the ship's log, 21 May-17 Aug 1878; partial list of single men on board; copy of printed brochure re Katikati settlement. Newspaper written on board the ship `Lady Jocelyn' on 18 Dec 1880 from London to Tauranga by William Malo de Rune Barclay 1842-1938(Captain). Includes article `Life in the 2nd cabin'. Carr came to New Zealand with his parents, brothers and sisters. Memories of the voyage made by F Carr as a child to New Zealand on the `Lady Jocelyn', Sept 1880-Jan 1881.
Letters from Wright to family in England describing voyage to Auckland on the `Lady Jocelyn', his work as carpenter on arrival and comments on social and economic conditions. One letter is written on the `Ruapehu', in the English Channel (3 Dec 1885). Joseph and Mary Chappell sailed from London to Tauranga aboard the `Lady Jocelyn', Sep 1880-Jan 1881. Joseph Bygrave Chappell d. 1916 , a carpenter, worked in the Tauranga district and Te Puke. Eliza Fielder was Mary Chappell's mother. The journal is based on letters written to Eliza Fielder by her daughter Mary and her son-in-law, detailing their experiences. Chappell, Joseph. Chappell, Mary (Fielder) d 1926. Diaries give a very full description of Weston's journey to New Zealand on board the `Lady Jocelyn' and his travels around New Zealand. Ernest Weston and his brother Harold travelled as 2nd cabin passengers. Typescript from original manuscript now in Aberdeen begun 15 November 1880 from notes started on 26 September at the time of embarkation. Smith notes that he rewrote the book on 14th, 15th and 16th February 1881 at Waerangi, Rangiriri, because `the rolling of the ship made the original such a scrawl'. Smith began his account on 26 September when he, his wife Jeannie and family embarked on the `Lady Jocelyn' as 3rd cabin passengers. He describes in some detail his fellow passengers and the daily events on board, as well as his first six weeks in Auckland and its environs. Included is an extract from the log of the `Lady Jocelyn'. Diary kept by Pearson on board the `Lady Jocelyn' for Auckland; he was a 2nd cabin passenger (22 Sep 1880-8 Jan 1881). Includes the signatures of some of the cabin passengers. Collection Record : Warnock, Thomas, 1850?-1939 : Shipboard diary and other papers (MS-Group-1044) Passengers contract ticket issued by Shaw, Savill & Co for Thomas Warnock for a passage aboard the `Lady Jocelyn' from Belfast to Auckland, 1878. Albert and his brother Henry Gray sailed from London in November 1855 aboard the `Oriental' and landed at Auckland in February 1856. They farmed on various properties in Canterbury and Albert left NZ permanently in 1882. The reminiscences describe Gray's childhood in Somersetshire, his voyage out to NZ on the `Oriental' and his farming experiences in Canterbury during the 1850s and 1860s. W P Harris immigrated to New Zealand with his wife Elizabeth and nine children. Copy of the diary of the voyage from Gravesend to Auckland NZ per ship `Oxford' under Captain Braddick. Left Gravesend 3 December 1881 and arrived at Auckland 10 March 1882. Scope and Contents : Diary covers the period 31 July-21 Dec 1864 and describes the progress of the ship, events on board and mentions fellow passengers.